In May 2011, I presented at the CREET one-day conference on Digital Literacies at The Open University. 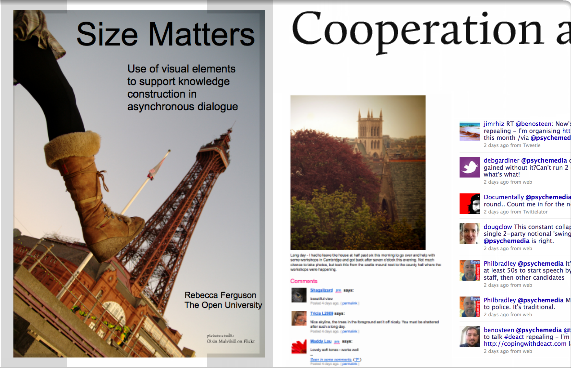 My presentation, Size matters: use of visual elements to support knowledge construction in asynchronous dialogue, was based on a small section of my doctoral thesis, and on a similar presentation I had given at the Open University’s CALRG conference the previous year. This entry was posted on January 8, 2012, 10:21 pm and is filed under Conferences, New literacies, Presentations, Thesis. You can follow any responses to this entry through RSS 2.0. You can leave a response, or trackback from your own site.